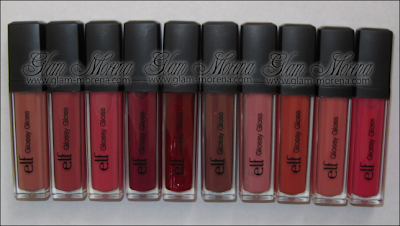 Glam Morena: Product Rave: e.l.f. Studio Glossy Gloss. 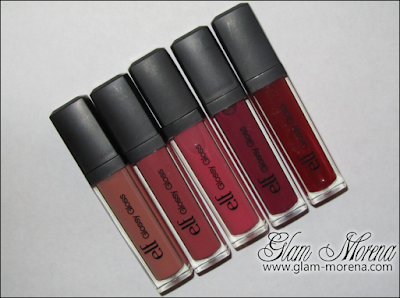 Product Rave: e.l.f. Studio Glossy Gloss. I've been wanting to try an e.l.f. Glossy Gloss since I came across one on a haul post. The shade that I mostly seen was Berry Blush. I was super excited when I was browsing the e.l.f. site to see that they finally added the e.l.f. Glossy Glosses. Of course I had to order all 10 shades! Description: Looking for ultra shine without the shimmer? Glossy Gloss is here! Our high shine, pigmented Glossy Gloss delivers a beautiful sheen and a rich tint of color to your pout. Great for wearing alone or over your favorite e.l.f. Cosmetics lipstick, lip pencil, or any lip color for a vivid gloss effect. The Vitamin E infused formula provides intense hydration and moisture, for lip pucker perfection! A photo of the e.l.f. Glossy Gloss without the flash on. Overall Thoughts: The e.l.f. Glossy Glosses are my new favorite e.l.f. product! They're part of the e.l.f. Studio Line and most of my favorite products from them are from the Studio Line. They're comparable to the Revlon Super Lustrous Lipgloss and the MAC Cremesheen Glass. Packaging: The packaging is really simple and sleek. It's very similar to the Revlon Super Lustrous Lipgloss packaging. I didn't have any issues with the top coming loose on any of the glosses. 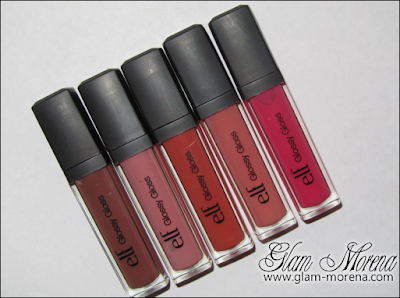 These lip glosses feature a brush applicator, which I rarely see with a drugstore lipgloss. If you're not a fan of the doe foot applicator then you're going to like these. The applicators aren't a big deal breaker for me. Formula: The formula is a creamy, sheer wash of color. I don't find them to be sticky at all. The formula is also similar to the Revlon Super Lustrous Lipgloss and the MAC Cremesheen Glass. They'e more similar to the Revlon Super Lustrous Lipgloss, but not as thick. It's definitely in between those two glosses. Scent: I read that these had a MAC scent. Upon opening a few I didn't notice that. I realized that the scent isn't the same for all 10 glosses. Some do have the MAC vanilla scent and others have a berry, fruity scent. The scents are consistent, but luckily they smell yummy. Availability: At first you were only able to purchase a few select shades at Target or Kmart. Online there are a total of 10 shades. They've been out of stocked since I placed an order last month. My Target doesn't carry e.l.f. available permanently, so I'm not able to purchase these locally. For only $3 there's no way I'm passing these up! 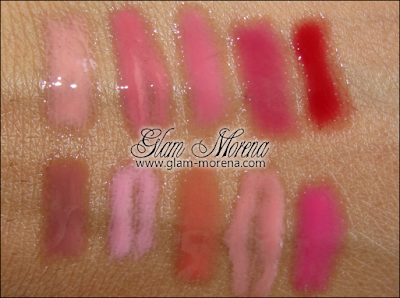 If you're a fan of the glosses that I mentioned above then I'm sure you're going to like these too. I'm currently waiting for them to be restocked so that I can get backups of my favorites. 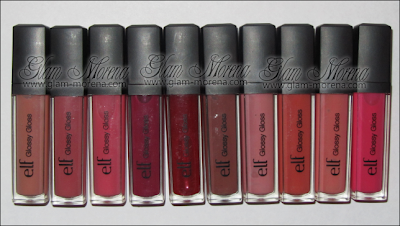 Swatches of all the e.l.f. Studio Glossy Gloss! Have you tried the e.l.f. Glossy Gloss? Any favorite shades? I definitely want to pick some of these up, especially those really pretty light pinks! Tangy tangerine is probably my favorite. Great post! I need all of these! Next time I place an order for mineral foundation some just might happen to sneak into my cart. I like Ballet Slippers. I need to check my Target. Oh man I wanted to order some when I placed my Elf order a week ago but most were sold out, I definitely need to check back another time. They look amazing, plus the price is super cheap! Great review. They're actually really pretty! and i love that they don't have a ton of glitter or shimmer like many glosses do! So you're the one who took them all,I've been trying to buy these! hahaha! Thanks for the swatches! There's many great shades! Loving all shades! Stop enabling Rai lol. soooo gorgeous! I'll be "wandering" wandering into the ELF cosmetic section today when I stop by Target. Based on ur post and vid i ordered 4! 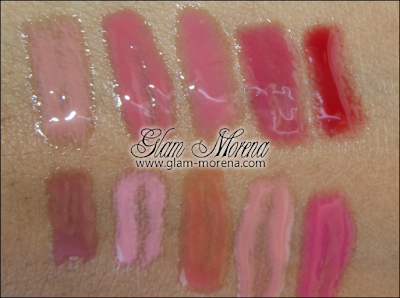 Tangy,ballet,berry and muted muave.. I love these and i shouted u out in my elf hual vid. I recommemd ppl buying online compare to stores. you dont have to worry about if the store has it or not. LOVE THESE!